Waterproof Cordura fabric. Pockets on the outside to hold 2 sip top water bottles, cell phone and more. Two large insulated pockets with pockets inside. 12 pockets total. Features carrying handles and grommets for attaching to your saddle. 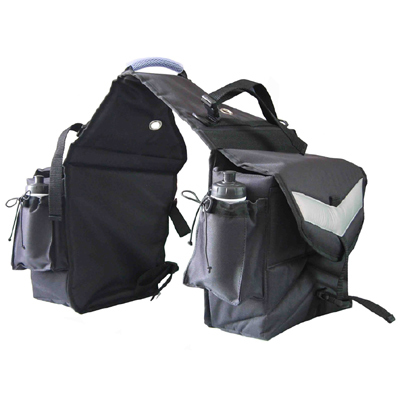 Saddle Bag comes in Black only with reflective stripes on the pocket flaps. Great for trailriders.